Published on 25 February 2010. Having a usable computer based internet connection when traveling is great. I am a convert to surfing on the train, and have been for a couple of years now. On top of that, having reasonably priced access to the internet when staying in hotels is always great too. To this end, I’ve used a number of set-ups over the last few years. 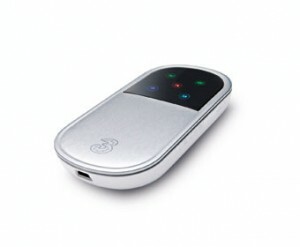 Initially, I used bluetooth tethering over 3G with my then everyday Nokia phone. This was great. I didn’t have to carry any extra kit, and I only had to get the laptop out on the train to surf – the mobile never needed to leave my pocket. Great for those moments when you’re absorbed in something and suddenly realise you’re pulling into your station, as there’s little to pack away (as someone who’s very easily distracted, this often happens to me…). The problem is that this method is slow. And I mean S-L-O-W. At the time I didn’t mind, as I was a virtuous individual who spent most of the time completing BMJ Learning modules on the train. These aren’t exactly data heavy, but even moving from one page to another in those was, well, tiresome with a slow connection. Contemplating Hagen–Poiseuille’s law (yes, really, I am that dull), I reliased that the Bluetooth ‘pipe’ was the limiting factor to the speed of connection, and started carrying a USB cable. But that was all a bit hassley, getting out the phone, plugging it in, getting it and the computer talking – just hassle, and more often than not I just bluetoothed it. Over time, my demands became greater. As I said above, I’m easily distracted, and so I started to want multiple tabs open in my browser, just like I do at home. This made my previous system grind to a halt – and as I was paying via my contract phone, I was constantly terrified that I was running up a bill the size of a small nation’s GDP (though, in reality, this never happened). So I went hunting for a new solution. As a Vodafone fanboy and long-term loyalist, I went for the Vodafone PAYG USB dongle-thingy, That may not be its proper name. The reason I chose it was the fairly fair pricing, in that PAYG credit never expires – unlike all other operators. But this dongle has its own problems. The biggest problem for me is that it doesn’t (easily) support Linux. When I’m traveling, I’m most often carrying my netbook. This has had a number of Operating Systems installed on it during its lifetime, but has most often run Linux (currently running Moblin, actually). It is possible to jimmy linux into talking to the Vodafone PAYG USB dongle-thingy, but it ain’t straightforward, and it isn’t terribly reliable. The other problem with this solution is the resilience of the Vodafone PAYG USB dongle-thingy. When on a train – and from the design of this device, this must come as a surprise to Vodafone – there are network blackspots. Tunnels, for example. I can accept losing connection briefly during this spots, I don’t expect mobile networks to defy the laws of physics. But I cannot accept the absolutely ludicrous amount of time it takes the Vodafone PAYG USB dongle-thingy to pick up a new signal and make the connection usable. Particularly when using a jimmied linux connection, it seems to take hours. This isn’t a problem for connecting in hotels, but on trains, it is a nightmare. Actually, the situation got so bad that when traveling on National Express trains, I started to rely on their Wifi – which anyone who has tried to use it will tell you is a serious test of patience. Oh, and then they made credit expire after 30 days, just like everyone else. So last week, I decided to try something new, in the form of a 3 Mifi doofer. I didn’t expect much. We’ve all heard horror stories about 3’s coverage, and I’m fairly sure that even they would admit it isn’t the best. But I have been unexpectedly impressed. The device is simple to operate, even though its five multicoloured flashing lights can be a little befuddling at first. The connection is the fastest mobile broadband connection I’ve experienced, and when a signal is lost, it regains it very quickly and seemlessly. There’s no hassle factor – switch it on, and my laptop just connects, it being one of my preferred wireless connections, and the device doesn’t even need to leave my bag most of the time. When checking my emails in my hotel last night, I actually forgot I was on a mobile connection. I was watching TV, netbook on lap as usual, MiFi dongle plugging in and charging on the other side of the room. Fantastic! Initially, I was put off getting a Mifi dongle because of the cost. But actually, the cost is a lot more reasonable than it first appears. For example, when I’m away for the weekend, I’m never really going to want to stream music or watch the iPlayer. I want a decent connection for bits of work and checking my email. 3 gives a 1GB allowance for £10, though admittedly this only lasts for 30 days. But looking at this from a different perspective, this is effectively all-you-can-eat internet for my purposes across a weekend, both at my destination and during my journey. Hotel Wifi would probably give me 24hrs continuous access for that kind of price… Much less convenient, and – for the same level of usage – much more expensive. So the Mifi dongle is great for me. And for people who want the level of net access on the move that I want, I’d recommend it – so I thought I’d let you know. This 1,412th post was filed under: Reviews, Technology, Gadgets, Linux, MiFi, Moblin, Three, Vodafone, Wifi.